The aim of Aikido is to develop the truly human self. It should not be used to display ego. In last night’s class I did what I believed was my best effort to date at teaching a technique. I covered all the points I had practiced, demonstrated the technique well, and spoke in a calm, confident voice. And my instructor wasn’t there to witness it. Last week we had studied a particular basic technique, and I’d been assigned to choose and teach a related technique for the following week (last night). I duly selected one and worked out a teaching method for it, highlighting some of the key similarities and differences. I arrived at class prepared and fired up to teach it. Two weeks ago I had overlooked a couple of key points in my chosen technique and taught at least one point incorrectly. Since then I’d been determined to show I could do better. Jon-san at his 1st Kyu test completing a technique similar to the one I taught last night. Our instructor arrived and unlocked the door with the mats (our club trains at a middle school gymnasium). Then he explained that he had been sick the previous two days and didn’t want to expose us to what he’d had, so he would not be at class. He turned control of the class over to the senior student and went over what he wanted us to practice, then left. Training without an instructor is not common, but it does happen, and there is a method for it. The most senior student present leads the class but does not “instruct” unless directed to do so by the usual instructor. Instead, the class trains together on selected techniques, with senior students assisting the juniors. But since two of us had been previously assigned to teach a technique that night, we went ahead with them, and all went well. Naturally I was disappointed that my instructor wasn’t there to observe my teaching method. But the class once again reminded me that Aikido, whether in training, teaching, or even writing about it, is not about stroking the ego. As has been taught in class many times, ego is to be left at the door of the dojo so the mind can be freed of its everyday clutter, creating space to receive new instruction. I’d arrived full of myself, thinking how *I* was going to impress everyone in class with *my* teaching. And if I’d succeeded in doing so, it would have only set me up for a bigger comedown later (speaking from experience here). So I’m sorry for what Sensei suffered, but it did some good, anyway. 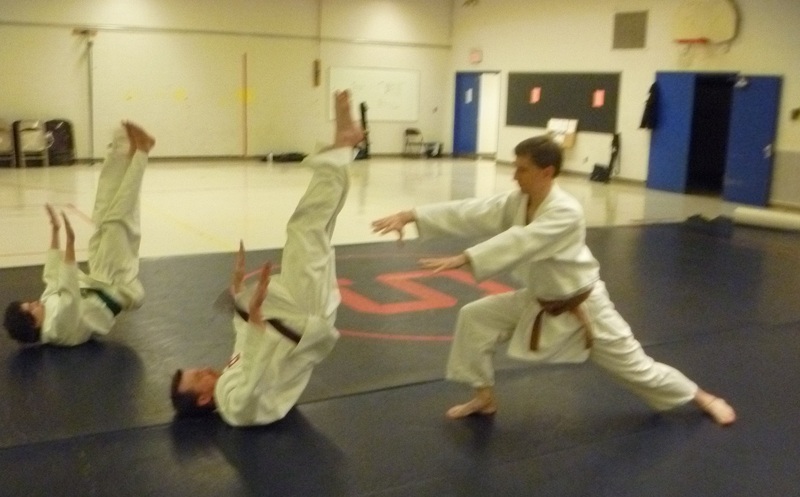 After the technique practice, we did breakfalls until the end of class. If you want to confirm or dispel any illusions about how fit you are, try doing a couple hundred of them sometime. There’s nothing like breakfalls to beat the ego out of you. 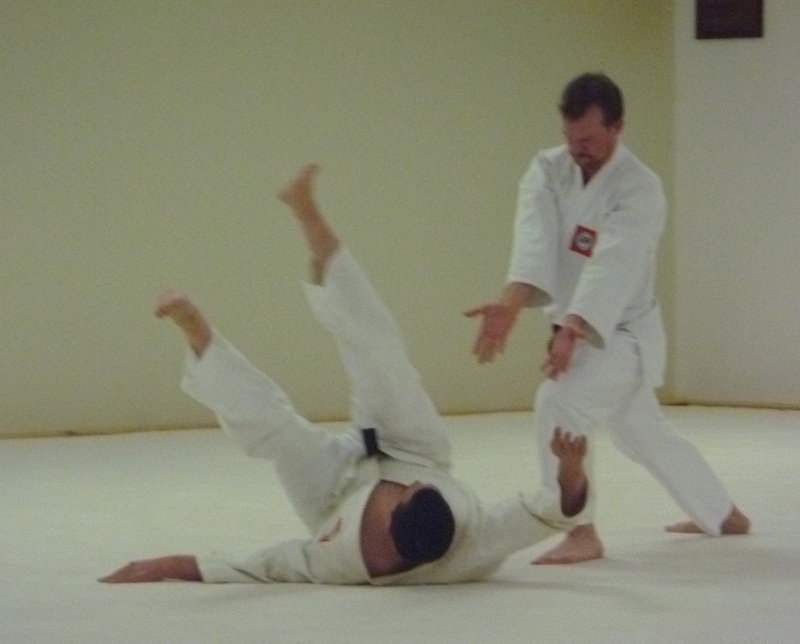 This entry was posted in Aikido and tagged Aikido, ego, training, Yoshokai. Bookmark the permalink.